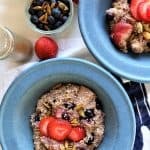 Quinoa Berry Breakfast Bowl Instant Pot. I typically use quinoa for a main course, dinner, lunch or salad meal. I have never really though of quinoa as a breakfast food, but wow, is it great for breakfast. Quinoa is a grain that is gluten free, high in protein, fiber, amino acids (making it a perfect protein), B vitamins and so very filling. That is the perfect food! With all of the nutritional value found in quinoa, it is the perfect food to give you the most energy to start your day. 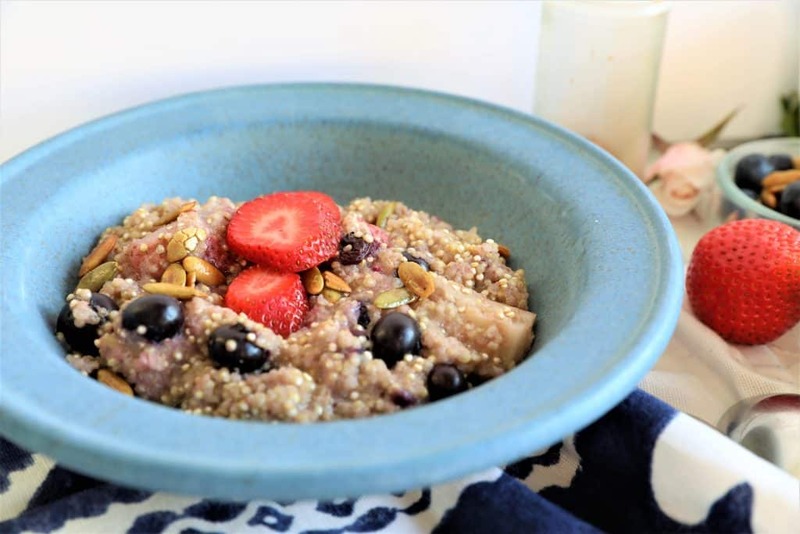 For breakfast, I like a sweet version of quinoa and this recipe is quick, easy and so very delicious. Starting with rinsed quinoa, we add maple syrup for sweetness and vanilla and cinnamon for spice. If possible, I like to add berries to every breakfast, and for this quinoa breakfast bowl, I have used blueberries and blackberries. Feel free to substitute whatever berries you have on hand, or even toss in a green apple. This bowl is vegan, vegetarian, gluten free and dairy free. So yummy and healthy! 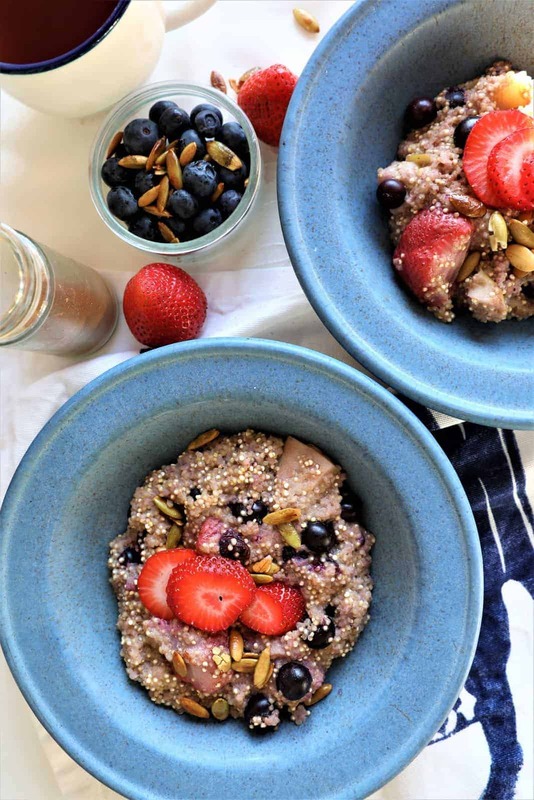 Quinoa Berry Breakfast Bowl made in the Instant Pot is creamy, nutritious deliciousness for breakfast! Add spices and fruit and this will be your go to favorite. 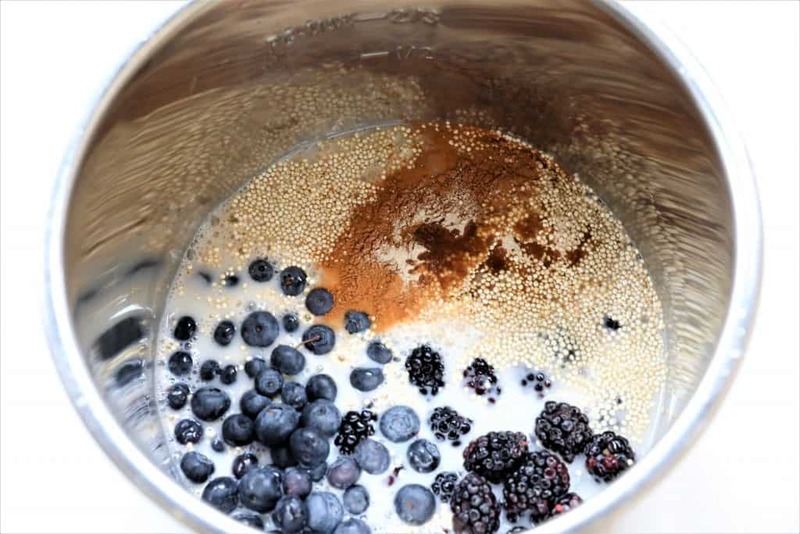 Add quinoa, spices, berries, maple syrup to Instant Pot. Stir and add almond milk. Set Instant Pot to pressure cook for 8 minutes. Let steam naturally release until completely vented. Serve topped with toasted pumpkin seeds and sliced strawberries. It is important to throughly rinse the quinoa before cooking, because it has a has a saponin coating that can give it a bitter taste. I like to cook quinoa in the Instant Pot whenever possible. It is ready in 8 minutes, and seems to retain moisture and have more flavor than with other methods. The nutritional value makes quinoa versatile and flexible for meals. You can add vegetables or fruits to quinoa, and the result will be either sweet or savory. It is stored in the pantry, so no refrigeration is necessary and that means that it can be your go to staple at anytime.